The Art in Eating Artichokes The Cook and the Curator - Eat Your History. 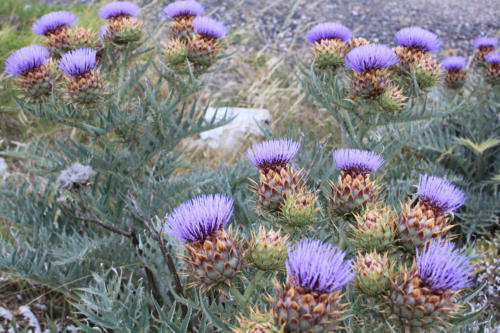 Globe artichokes have been popular in the Mediterranean region since antiquity. Bud or Bloom? 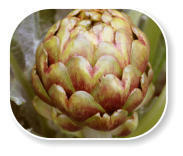 Do we prefer to enjoy the globe artichoke’s delicious flavour or let the bud go to flower to show off its amazing bloom? How to Eat Artichokes Eating globe artichokes is a hands on affair, so when eating them just enjoy them and forget the rules of etiquette! Healthy Habits Eating globe artichokes is a hands on affair, so when eating them just enjoy them and forget the rules of etiquette! 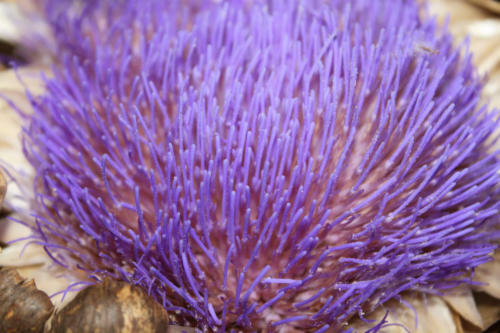 Artichoke History The first artichokes had very thorny exteriors, yet someone dared to discover this interesting-looking vegetable. The Art in Eating Artichokes The Cook and the Curator - Eat Your History. 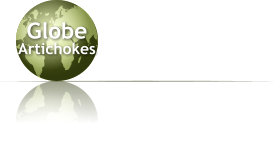 Globe artichokes has been popular in the Mediterranean region since antiquity. Bud or Bloom? 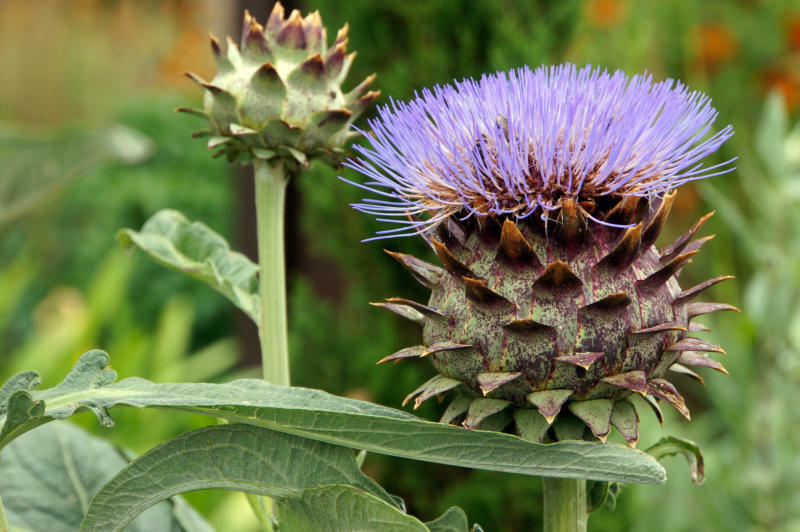 Most people eat the artichoke buds while other allow the plant to flaunt its spectacular blooms. Healthy Habits It is a known fact that vitamin deficiencies and poor habits can lead to a range of health problems causing illnesses. Globe Artichoke History The globe artichoke is one of the oldest known vegetable in ancient history which was considered to be quite exotic. How to Eat Globe Artichokes Eating globe artichokes is a hands on affair, so when eating them just enjoy them and forget the rules of etiquette! Anyone who journeys out past paddocks or open fields at the moment will be rewarded by the most magnificent views of vivid blue and purple hues of the spectacular flowers produced by the glorious wild artichoke, which is closely related to the globe artichoke. 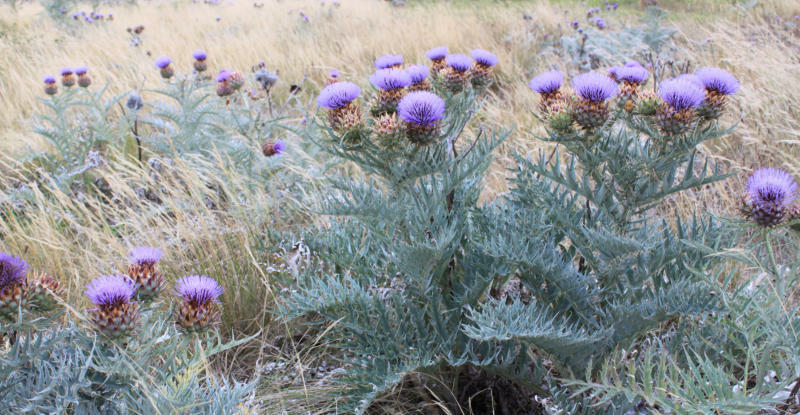 With the arrival of summer, the wild artichoke bursts into bloom blanketing fields and meadows with clusters of fern-like thistle plants providing beautiful arrays of blooms. It is definitely an amazing natural spectacle for any flower or photography enthusiast! 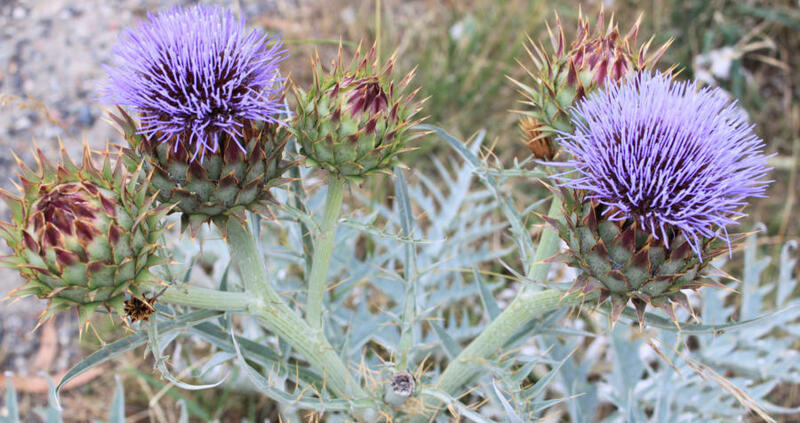 Although this wild artichoke is meant to be good to eat, it is so full of thorns that it is not worth any effort of picking and preparing for consummation. They have their leaves covered in prickles including the stem and the bud. This is nature’s way of protecting the plant against herbivores animals; discouraging them from feeding on the plant. Honey created from thistle plants is delicious and produces a very fine quality. 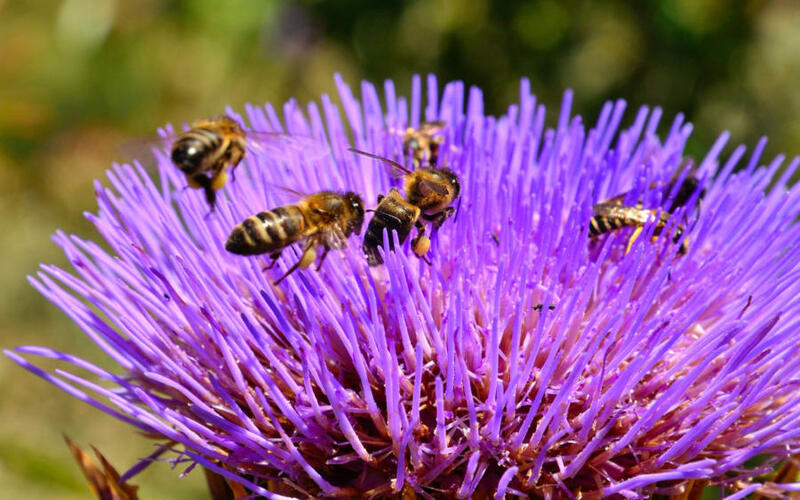 The artichoke belongs to the thistle family and, with their plentiful supply of sticky, scented pollen, their flowers attract many bees. 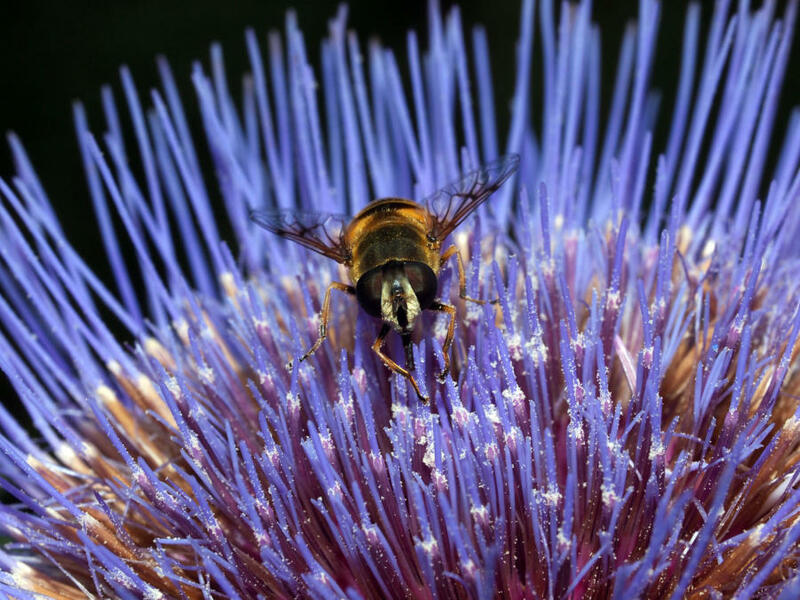 Although pollen is important for cross pollination and vital for plant reproduction, bees collect it for protein. They also collect nectar to store in their hives and to feed the adult bees. The unique design of the honeycomb and the process of fanning causes evaporation to take place, creating the thick, sweet liquid known as honey. Globe artichokes are members of the thistle family, which is a common name for a group of flowering plants characterised by leaves with sharp prickles on their tips. New edible varieties have now eliminated most of the thorns, making them easier to handle. Fulfilling the needs of bees is important to the honey industry as this ‘golden liquid’ is one of the most important substances on earth – not only because it is a healthy substance for us but because the process involved in honey making also pollinates billions of seeds. 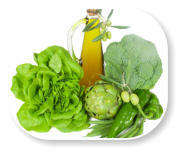 Without plants we would be reduced to little more than a water diet, as animals also need plants for sustenance. 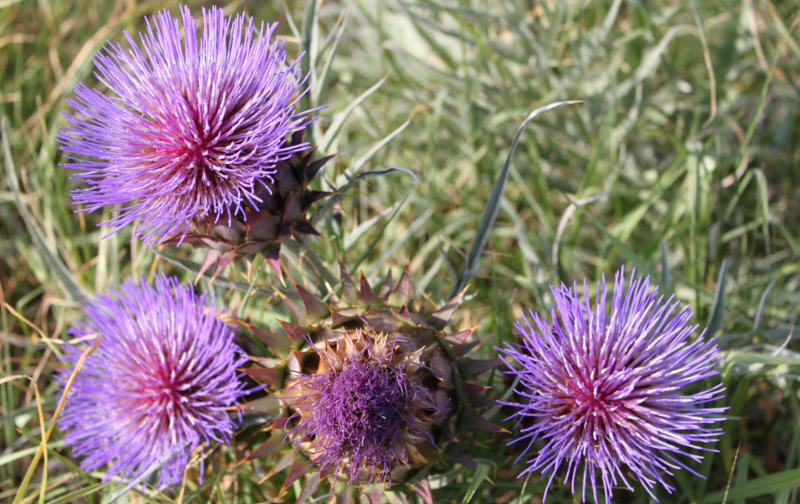 Italy is one of the many European countries that is well known for producing honey from artichoke or thistle plants. 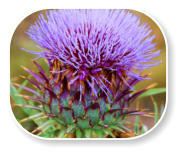 The artichoke plant honey has a light amber colour and a delicate floral smell. 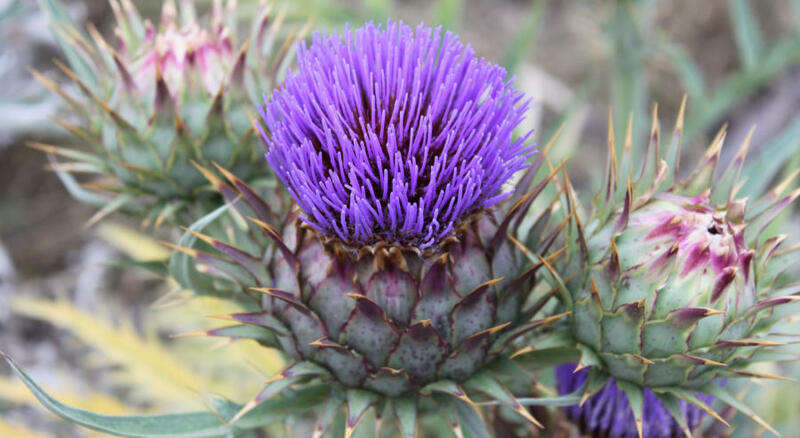 The edible globe artichoke is actually the plant's flower bud, and if not harvested and left to mature, it will blossom into a beautiful exotic purple-blue or violet flower. The globe artichoke has many bracts (petals) attached to a central heart. As the bracts open they form striking thistles in the centre and can vary from 8-16cm in diametre which can range from pale lilac, blue-purple or a darker purple. Unfortunately the spectacular, silver-leafed globe artichoke hardly ever gets to show off its impressive flower, as we enjoy globe artichokes too much to allow them to bloom and flaunt their pretty blossoms. 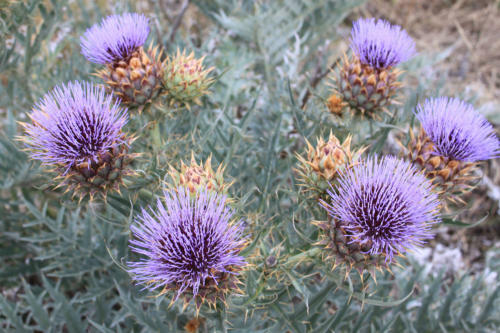 Artists are using artichoke flowers more frequently in their paintings and sculptures. 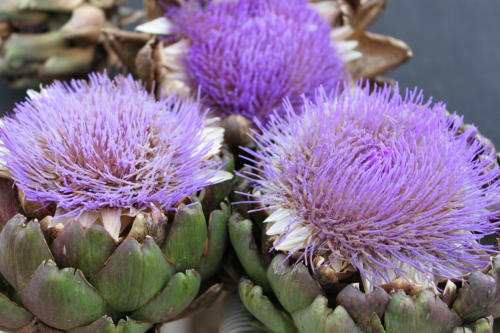 Artichoke flowers make beautiful motifs and are seen often on kitchen items or tableware. The globe artichoke is also used as an attractive display which makes an interesting alternative when combined with other flowers or green foliage. They also make unique and interesting centrepieces - always a great conversation piece! 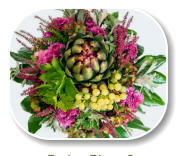 Florists are very familiar with the artichoke flowers and recognise that they make striking, decorative floral displays. They are constantly using these flowers to create beautiful arrangements knowing their long cut stems usually last for a longer period of time then other more delicate flowers. Artichoke flowers are often seen in large, stunning displays in offices, hotels or reception centres. Artichoke plants are very popular in English gardens. Horticulturists are using these beautiful silvery grey fern-like plants in their gardens both as a vegetable and as ornamental plants, only to be rewarded with the spectacular purple-hued flowers they produce. 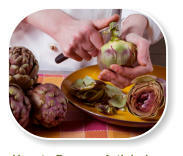 How to Prepare Globe Artichokes The artichoke is definitely worth any preparation! They are not as intimidating to cook once you know how. 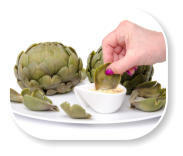 How to Prepare Artichokes The globe artichoke is delicious and well worth any effort. Easy to prepare once you know how!